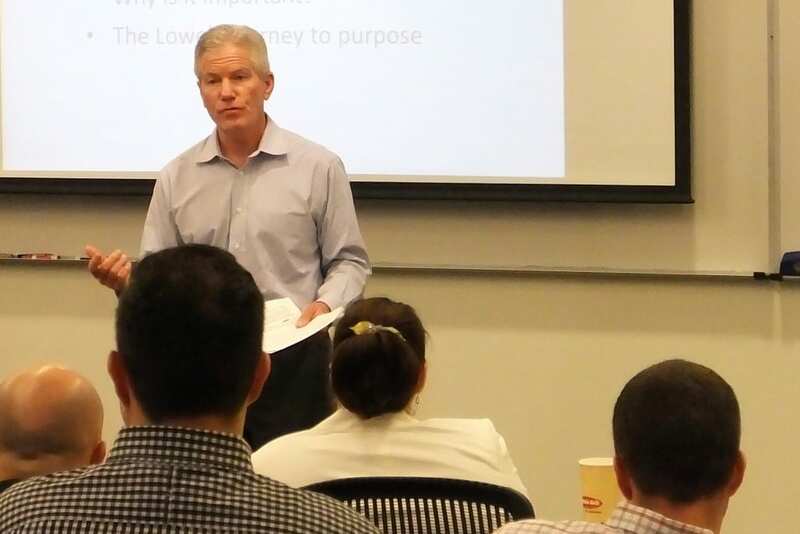 Bridgeford, who retired from Mooresville, N.C.-based Lowe’s in 2014 after 32 years with the company, said his interest in creating a purpose-driven business actually took root when he was an MBA student at the School. His professor was teaching from a book called “The Functions of an Executive” by Chester I. Barnard, a text he still keeps close by today. Barnard suggested that “at the core of organizations is this unifying concept called purpose. An organization has to define a purpose for long-term continuity of success,” Bridgeford explained. The executive must ensure that everything the company does supports that purpose. It’s more than a mission statement. To distill the Lowe’s purpose into that one simple statement – “to help people love where they live” – Bridgeford’s team spent time in markets from coast to coast, at hundreds of stores at all levels. Employees kept journals and wrote blogs. They connected through chat rooms. What Lowe’s found was that the company had underestimated the emotional tie people have with their homes at different stages – and the emotional connection employees made when helping their customers. Adam Coremin (MBA ’16), vice president-strategic accounts for Precept Wine, is part of the team determining his company’s vision and purpose. He said that hearing about how Lowe’s did it – and the dedication and time required – was helpful. It does take a lot of time, Bridgeford said, and a great deal of exploration. The Lowe’s team had to consider all of the roles the company plays, from helping with joyful moments such as getting a nursery ready for a new baby to rescuing people in times of natural disaster such as Hurricane Hugo. He recommends you start with changing your relationship with the customer. Lowe’s scans public channels for phrases on home improvement, the Lowe’s name and the names of competitors to measure what emotions are tied to specific home improvements. Customers walk through stores wearing electrode caps to log emotional responses to displays, sections and products as part of the company’s research. All to help the company remember the heart in everything its workers do, every day. Answer the why for all the whats and hows the team does every day. In the Lowe’s case, every action by the team helps people love where they live. And Bridgeford says, for any company’s case, it helps you get up and love what you do every day. Alicia W. Roberts is a freelance writer, editor and communicator, based in Charlotte, N.C.